This is my main band – Ska / Jazz / Reggae fusion. Welcome to my Ray Carless Club Skaaville website, I’m a London based Jamaican saxophonist. Club Skaaville started promotional existence as a live music platform that provided mobile live performance stages for myself as well as my musician my colleagues to perform locally. I utilised London venues such as Pappeos in Caledonian Rd, Islington, Visions Bar in Hackney the Paradise Bar, Bar 300 Walthamstow, The Flyover Club in West London and many others.. In conjunction with Niles Hailstones aka Ras Asheber of Afrikan Revolution, I sourced and developed various places of entertainment to stage some of my favourite bands and artistes. Black Roots, Black Slate, The Divettes, Linda Muriel, Imaani, Wendy Walker, Beverley Skeete, Amaziah, Andy Wood Mitchell, Gracious, Delroy Pinnock, Michael Arkk, Michael Gordon, Kevin Leo, too many to mention here…. The promotional side of this music business became increasingly demanding through recent years and as much as I enjoyed making events happen, I couldn’t always afford to devote the required time to be involved in promoting so many different events. Now is the time for me to focus on our fledgling Windrush Jazz & Ska band project where we play the music from the era that our parents grew up in. I’m still enjoying making music and my latest release is an EP that features the music genres that I love most, Ska, Blue Beat, Rock Steady, Jazz, Reggae & Afrobeat. 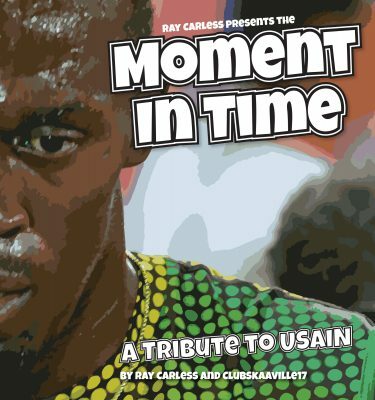 The lead track on the EP is dedicated to my present day sporting hero sprinter Usain Bolt who’s now turning his sights on professional soccer. The song is called ‘Moment In Time’ and it’s available for download as well as on cd and vinyl. We’re currently performing Windrush Jazz & Ska around London in the lead up to Black History MonthThe past 2 years has found me performing gigs and mini tours with the legendary 70’s Nyah Funk band CYMANDE, as well as the occasional performance with the breathtaking Jamaican Studio One trombonist Vin Gordon, The Skatalites and the newly formed BFA (Brit Funk Association). I hope that 2019 will launch Ray Carless & Club Skaaville Allstars in the direction of a club or festival near you.